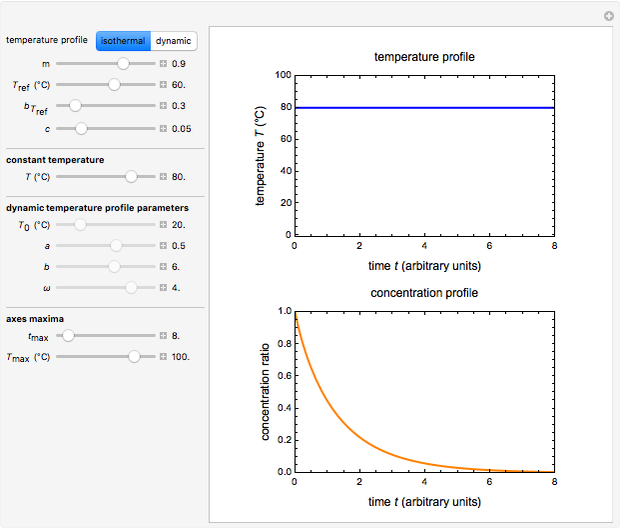 This Demonstration shows isothermal and selected dynamic chemical degradation patterns that follow the Weibullian ("stretched exponential") model with a constant shape factor (exponent). The temperature dependence of the rate parameter is described by a simple exponential model which, as has been previously shown, can be used interchangeably with the Arrhenius equation. There is evidence in the literature that the isothermal degradation of certain nutrients can sometimes be better described by the Weibullian model than by fixed-order kinetics [1, 2]. 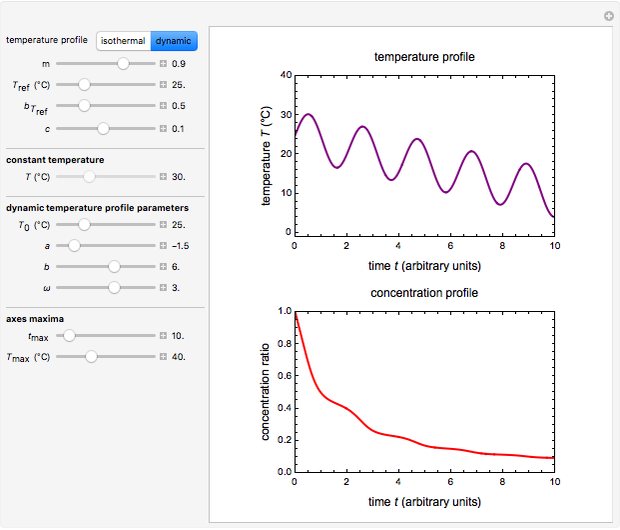 in this model is the time-dependent concentration ratio, is a temperature-dependent rate constant and is the shape factor, assumed to be constant or a very weak function of temperature. The temperature dependence of is assumed to follow the Arrhenius equation, which can be replaced by the simpler exponential model without sacrificing the fit . In this model, is the rate constant at an arbitrary reference temperature , both and are in °C, and is a characteristic constant having units of . Incorporating , thus defined, into the isothermal degradation equation leads to the general isothermal model . 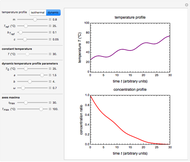 Assume that when the temperature varies, the degradation rate is the isothermal rate at temperature , at time that corresponds to the concentration ratio [2, 4]. Implementing this assumption renders the general dynamic degradation model in the form , with the boundary condition , from which is determined. 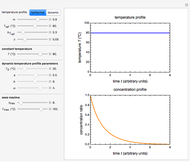 In this Demonstration you can choose between simulating isothermal degradation at chosen constant temperatures or, as examples, dynamic degradation at linearly rising and falling oscillating temperatures. 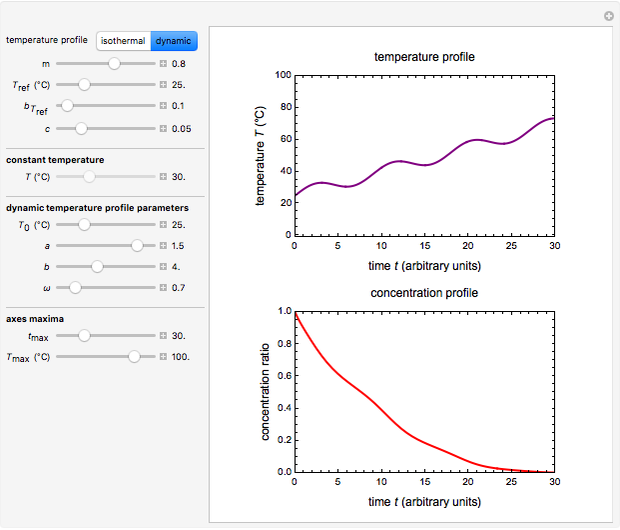 You can vary the degradation kinetic parameters, namely, , and with sliders. You can also vary the constant temperature . 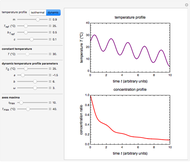 For dynamic degradation, you can vary the temperature profile parameters , the initial temperature in °C, the slope of the temperature rise or fall in units, the temperature oscillation amplitude in °C, and the frequency in units of . Not all combinations of the temperature profile parameters , , and in the dynamic temperature profile equation and the kinetic parameters , and lead to realistic degradation curves. M. G. Corradini and M. Peleg, "A Model of Non-isothermal Degradation of Nutrients, Pigments and Enzymes," Journal of the Science of Food and Agriculture, 84(3), 2004 pp. 217–226. doi:10.1002/jsfa.1647. M. G. Corradini and M. Peleg, "Prediction of Vitamins Loss During Non-isothermal Heat Processes and Storage with Non-linear Kinetic Models," Trends in Food Science and Technology, 17(1), 2006 pp. 24–34. doi:10.1016/j.tifs.2005.09.004. M. Peleg, M. D. Normand and M. G. Corradini, "The Arrhenius Equation Revisited," Critical Reviews in Food Science and Nutrition, 52(9), 2012 pp. 830–851. doi:10.1080/10408398.2012.667460. M. Peleg, A. D. Kim and M. D. Normand, "Predicting Anthocyanins' Isothermal and Non-isothermal Degradation with the Endpoints Method," Food Chemistry, 187(15), 2015 pp. 537–544. doi:10.1016/j.foodchem.2015.04.091. Mark D. Normandand Micha Peleg "Weibullian Chemical Degradation"